Lesli Wood is the creator of La Curie, an award-winning, niche fragrance house that blends wistful and extraordinary fragrances in small batches in the Sonoran Desert. We met Lesli during one of our trips to the Southwest and were instantly drawn to her fascinating and unusual array of signature perfumes – our first La Curie scent, Perfume Oil No 1, instantly transports anyone that grew up in the American Southwest with its undertones of spicy, arid earth and fresh, lively notes that inexplicably call to mind creosote in a warm rain. Released on average only once per year, we spoke to Lesli to find out more about what goes into creating her captivating collection. 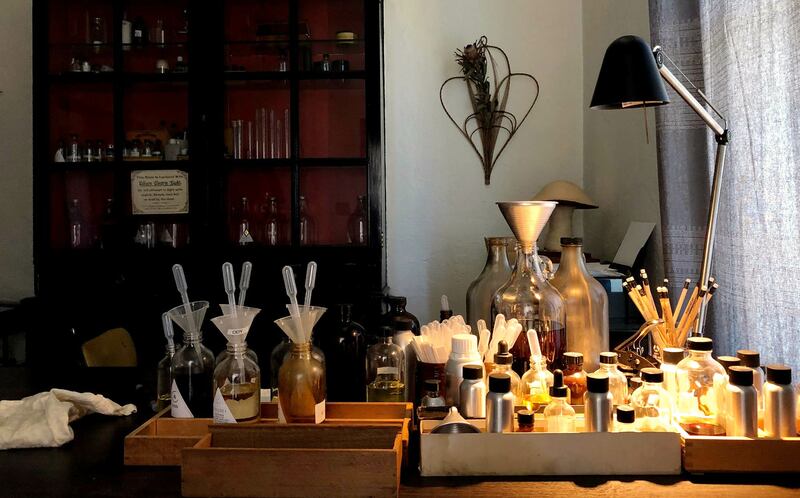 You were one of our very first vendors after we happened upon one of your amazing scents on a trip to AZ – when did you start La Curie and what was the initial idea behind it? I started experimenting with fragrance making six years ago to make something for myself that combined french parfumerie techniques with natural handmade oils. After a few people encouraged me to make more, I started experimenting and making scents based on mythologies and ancient places. I wanted people who had given up on wearing perfume to have something ‘interesting’ to wear. Your perfumes are very distinct and have an unusual quality that we can’t really put our finger on. Tell us a bit about your process and how they come to be? Do your scents start with an idea, a mood, nostalgia for something, or do you just get an idea for a blend that you think might be interesting? When I create a new scent, I’m trying to capture some of the enigmatic and dreamy combinations that are in my head. It’s a strange process to explain but it’s part of why I don’t release many perfumes, usually one per year. When you design clothing or accessories, you tend to have a particular style, era, or type of person in mind as your muse, inspiration, or audience. Is scent similar in any way or can it be left more open and fluid? I am making for everyone and part of my goal is to get people who aren't into wearing fragrance to have a signature scent that feels like it's part of their identity. An identity that lives outside the mainstream and certainly outside of a mall or corporate influence. How do you name your scents? The scents are named after the theme/place/myth that I want to explore. For example, my first fragrance ‘Faunus’ was an exploration of a European forest and through research and reading Horace, I thought Faunus would be the perfect name for the scent. It helped define the direction of the fragrance even more in depth. Do you think as a maker you’re influenced by your surroundings in other ways? I’m torn between the love of daydreaming and the desire to be normal. In addition to your work with fragrance, you’re also involved with other creative projects. Tell us a bit about that. What’s next for La Curie? That is a very good question…stay tuned.